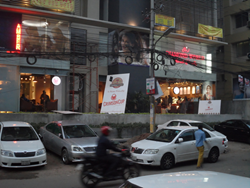 Residents of Dhaka, Bangladesh can now enjoy Crimson Cup Coffee & Tea at two locations. A second Crimson Cup Coffee House in Dhaka's Dhanmondi neighborhood has joined the original location in Banani. “We’re excited to open the second Crimson Cup Coffee House in Dhaka. The managing directors, managing partners and investors have created an inviting space for Dhanmondi residents to enjoy handcrafted espressos and other coffee drinks. Columbus, Ohio coffee roaster Crimson Cup Coffee & Tea has opened a second international coffee shop in Dhaka, Bangladesh, less than a year after its first shop opened in Dhaka’s Banani neighborhood. The new Crimson Cup Coffee House is located at House #275/d, Road 27, in the Dhanmondi neighborhood. Crimson Cup Bangladesh is a joint project of Managing Directors Mohaimin Mostafa and Rehanur Rahman; Managing Partners Tareq Rafi Bhuiyan and his wife, Ayesha Rawshan Bhuiyan; and Investors Sararaz Anwar Upol, his wife, Shahana Mirza Asha, and her brothers Mirza Abdul Khaled and Mirza Abdul Khales. Several of the partners absorbed American coffee culture while studying in campus coffee houses as foreign exchange students at the Ohio State University in Columbus. Returning to Bangladesh, they saw an opportunity to capitalize on the growing popularity of American-style coffee in their predominantly tea-drinking country. Crimson Cup Coffee House Dhanmondi offers a wide range of handcrafted hot, iced and frozen espresso drinks as well as hot and iced teas. It is the first café in Dhaka to feature a brew bar, where baristas hand-pour craft coffees discovered during Crimson Cup’s sourcing trips all over the world. Initial offerings included Crimson Cup’s Mexican Colorada, Guatemalan Pacamara, and Ethiopian Ardi coffees. Fresh-baked pastries round out the menu, and customers can also buy bags of fresh-roasted beans to brew at home. Day-to-day operations at the new Dhanmondi shop are handled by baristas who learned their craft at the Banani coffee house before being promoted to manager. The entire team of managers and baristas underwent five days of intense training with Crimson Cup 7 Steps Trainer Steve Bayless to prepare for the January 22 opening. The team served more than 500 drinks at the star-studded grand opening. The day’s festivities began with a celebration of actor Naya Raj Razzak’s 75th birthday, as he bestowed his best wishes on the new shop. Joining him and remaining most of the day was renowned lyricist, composer and filmmaker Gazi Mazharul Anwar. Actor Ananta Jalil and wife actress Barsha arrived later to cut the opening ribbon and taste the latest additions to the pastry case. After opening two coffee houses since May 2015, the Crimson Cup Bangladesh team is already planning to expand. Managers are looking for locations in the cities of Sylhet and Chittagong, the resort city of Cox Bazar, and other sections of Dhaka, including Uttara and Mirpur.